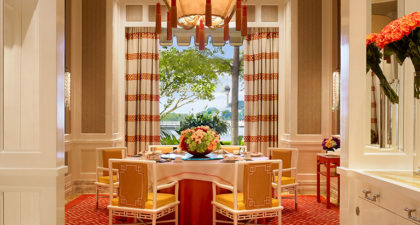 Wing Lei has garnered a reputation as one of the best Chinese restaurants in Macau with its Michelin star. Delicate birds’ nests, Japanese abalone, Alaskan King Crab and Australian lobster all find their way into Executive Chef Peter Chan’s classic Cantonese cuisine and creative, handcrafted dim sum dishes. The restaurant’s bold and modern Chinese décor features a dazzling Swarovski crystal dragon emerging from the wall. But for those who prefer a more intimate setting, the restaurant has five private rooms equipped with flat-screen TVs and private washrooms. 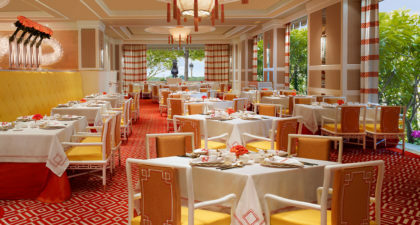 Dinner menu highlights include several vegetarian and vegan options, as well as a balance of seafood specialities and chicken, beef, lamb and pork creations. If the 14-page menu overwhelms, there are Signature Sets pricing in around 1200 MOP or 1680 with wine (150 USD or 210 USD with wine). Average dishes are about 200 – 300 MOP each, excluding Chinese delicacies. Reservations recommended.